The magazine “Globus” (English: The Globe) is issued since 1969. It is designed for geographers, but also the general public. It publishes works in methodology, methods and didactics of geography, as well as other articles that may be of greater scientific importance. The journal is published once a year. Papers are not seeking a fee. 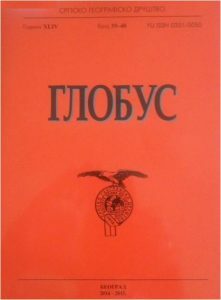 The journal is one of the most quoted in Serbia, in the field of geography. In the number 30 the bibliography of all previous numbers was published. Numbers from 1 to 16 are edited by Jovan Ilic, and the number 17 of the “Globus” magazine is edited by Dr. Mirko Grcic.